Edmonds high quality eave vents are designed to work in conjunction with roof vents to allow cool, fresh air to be drawn into the roof space. The air drawn in from outside helps to improve the cross flow ventilation and help the roof mounted vents to work more effectively and efficiently. The Polyeave Vent can be used in most homes with adequate eave space. 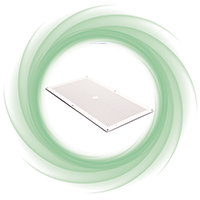 Manufactured from temperature stable ABS polymers, the small inlet holes prevent most insects from entering the roof space but allow airflow into the roof space to improve cross flow ventilation with roof vents.